In Formula One, Monaco is as difficult as it is beautiful. It’s hard to pass, so seeing that happen is impressive but rare. It’s the spectacle of modern F1 cars hustling through a course where they barely seem to fit at speed. That’s why Daniel Ricciardo’s pole position lap—which set a new record there—is a must-watch. How? I’m just... how? Stare at it in disbelief with me. Click through to watch the video on YouTube. 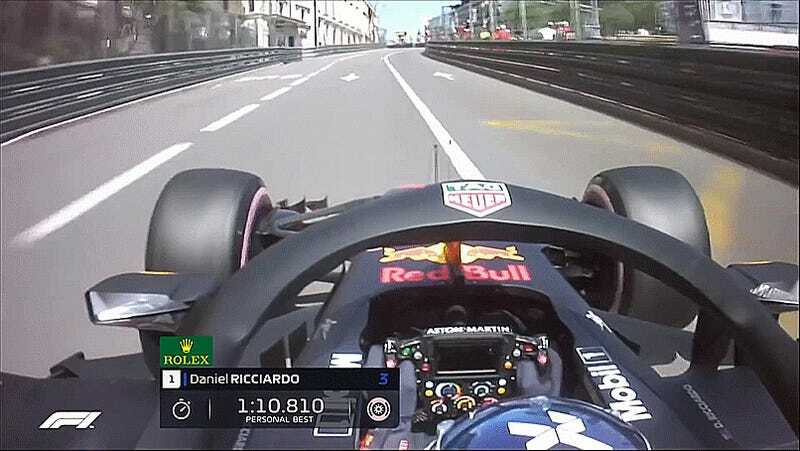 Somehow the Red Bull driver whipped out a ludicrously fast 1:10.810 during qualifying yesterday, which was the fastest anyone’s ever gone around the Monaco Grand Prix circuit. Perhaps the new hypersoft tires helped a bit—they’re the stickiest, fastest tire Pirelli has ever whipped out. But yikes, man. Monaco is a 19-corner circuit built on a steep hillside by the sea, where the walls are right there and your apex is usually just off a pointy wall with some curby paint in front of it to warn you. You’ll get blinded worse than the camera coming out of the big tunnel, too, for good measure. There is less than zero margin for error, either. Like the other video, click through here to watch the video on YouTube. Ricciardo is really Red Bull’s only hope barring any miracles today, as his teammate Max Verstappen ate it in a hard, air-catching way in Free Practice 3 and the team couldn’t get his car back together in time to qualify. Verstappen starts from the very back. Luckily, Ricciardo’s second pole position of his career (the other of which was also at Monaco) puts him right in front for one of Formula One’s hardest to pass races. Here’s hoping his team doesn’t screw this golden opportunity up again. Full qualifying results are here, and the race is on right now.